The Battle of Marianna, Florida by Dale Cox (Dale Cox, Publisher. 2007). Slavery, Resistance, Freedom edited by Gabor S. Boritt and Scott Hancock (Oxford University Press, 2007). Reading the Man: A Portrait of Robert E. Lee Through His Private Letters by Elizabeth Brown Pryor (Viking, 2007). 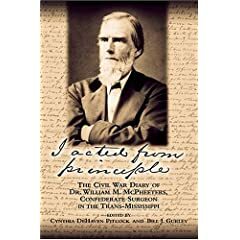 I Acted From Principle: The Civil War Diary Of Dr. William M. McPheeters, Confederate Surgeon In The Trans-Mississippi edited by Cynthia D. Pitcock and Bill J. Gurley (University of Arkansas Press, 2005). Stealing the General: The Great Locomotive Chase and the First Medal of Honor by Russell S. Bonds (Westholme Publishing, 2006). Fighting for Paradise: A Military History of the Pacific Northwest by Kurt R. Nelson (Westholme Publishing, 2007). If you'd like to see and hear replica CW cannon fire live rounds, check out this site (thanks to Jeff G. for pointing it out). I've viewed video of lighter field pieces before, but siege guns in action are new to my senses. Among the big boys, I was particularly impressed by the audible power of the 13 in. seacoast mortar round. Even with the sound distortion, one can readily appreciate the morale effect of such shelling. The "Dictator" indeed. As mentioned earlier, I recently finished reading historian Scott Patchan's latest book Shenandoah Summer: The 1864 Valley Campaign (click here to read the review) and he kindly agreed to answer a few questions about his work. DW:Hi, Scott. What factors led you to make the 1864 Valley Campaign your primary area of study? SP: I have been a military history junkie my entire life. When I moved to Roanoke , VA in 1985, I saw the roadside markers and read about the Lynchburg Campaign and the Battle of Cloyd's Mountain. I then attended James Madison University in Harrisonburg, where I fell in love with the Valley, traveling out to Port Republic and Cross Keys. Wanting to learn about the Valley in years other than 1862, I found George Pond's book on the '64 Valley Campaign in the JMU library and was hooked. The size and scope of the overall 1864 Valley Campaign and its relative lack of study compared to Jackson 's campaign really pulled me toward it. DW: In studying your publishing options, why did you ultimately choose an academic press? SP: For all of the criticisms of academic presses, they are still the primary conduit of campaign and military studies. DW: I agree, and believe they also are by far the most consistent in turning out the highest quality works. How would you describe your experience with Nebraska in working with them to put together the book YOU wanted published? SP: They were professional, easy to get in touch with and responsive to my ideas. They actually let me put in more maps and photographs than I was initially told. I am very grateful to George Skoch for stepping in very late in the process when I suddenly found myself in need of a mapmaker. DW: You've mentioned on another venue that you are interested in revising your Piedmont book for a new edition. Is that project still in the cards? Keep in mind it will destroy the value of my scarce first edition. SP: It is in the cards for some point. I was originally going to put the time into this year but have moved on to a couple of other projects such as the Cedar Creek issue for Blue and Gray. I guess I'll wait until you really cash in on it so you can get max value for it. I have a couple of copies laying around here too. DW: Now, getting to your latest book "Shenandoah Summer"...For me there really is no "The" 1864 Valley Campaign. With so many different objectives, armies, and commanders involved, one could argue that there are 5 distinctive campaigns [Sigel in conjunction with Crook/Averell; Hunter's Raid; Early's Raid on Washington ; the period covered in "Shenadoah Summer"; and the final phase -- the arrival of Sheridan to clean it all out for good]. What's your own view on all this? SP: The 1864 Shenandoah Valley Campaign is a campaign in its own right because all of the events that you mentioned are related and dependent upon each other. You used the word phase, which is a good way of looking at it. The events of the various phases are interconnected. For example Hunter replaces Sigel and he continues on with essentially the same objectives that Sigel had but is successful. Hunter's success forced Lee to detach Early, whose success at Lynchburg opened the door to his raid on Washington which brought the Sixth and Nineteenth Corps into the picture. I could go on but there are clear linking events between all of the phases that you mention. Always keep in mind too, that the 1864 Valley Campaign is a component of Grant's overall strategy of constant campaigning to wear down the Confederacy. The whole nature of warfare in Virginia changed in 1864 and the Valley changed with it. DW: I believe Jubal Early has gotten a bit of a raw deal from historians for his overall performance in the Valley. In your view, what were his primary success(es) and failure(s)? What overall grade would you give him? SP: Tactically, 2nd Kernstown was his masterpiece and it led to the burning of Chambersburg which caused a shockwave that shifted the strategic balance in the Valley. Monocacy, Lynchburg, and Snicker's Gap would be other successes. To learn about Early's biggest failure in the campaign, you'll have to wait for the next volume which I'm hoping to complete this year. Simply put, while "Old Jube" was a fighter, he lacked the deftness of Stonewall. Nevertheless, Early's efforts contributed in the Valley greatly to the survival of the ANV at Petersburg in 1864 by forcing Grant to detach Sheridan and 30,000 men to the Valley. DW: I was pleased to see you laud the service of some highly competent but lesser known figures like Isaac Duval. Taken from the period covered by your own writing, who is your favorite unsung officer for either side? SP: I'd like to expand upon that question if you don't mind to touch some on how history comes to us. Joseph Thoburn is probably the most underrated unsung hero of the entire Valley campaign. He was there from New Market to Cedar Creek where he met his maker. He has been completely lost to history for the most part. However, his peer, Col. Rutherford B. Hayes went on to become President and has been vastly overrated as a commander. Don't get me wrong, he was a very capable leader but if he had not been President the average Civil War reader would not think of him any more than you would Thoburn. On the Southern side, Brig. General Robert Johnston of North Carolina shows himself to be a top notch combat leader on a number of occasions during the '64 Valley Campaign. He demonstrated his skills at Lynchburg, Rutherford's Farm, Kernstown, Third Winchester and Cedar Creek. DW: George Crook remains a bit of an enigma. Even though he had a decidedly mixed combat record in the Civil War, historians promote a generally favorable view of him (and your own research has shown that the common soldiers respected him highly). What's your opinion of Crook? SP: As Crook was a former hero of mine, my findings on him were the source of immense disappointment. While he had some ability, he seems to have some sort of John Pope-like personality flaw in dealing with officers whom he viewed as potential rivals. Averell and Duffie are to Crook at Second Kernstown what Fitz John Porter was to Pope at Second Manassas. In both cases, officers who were faithfully executing their duty and were trying to warn their commander of a very real approaching danger to their army were basically ignored because their commander did not like/trust them. Crook, however, was good friends with Sheridan, redeemed himself at Winchester and Fisher's Hill and rode Sheridan 's coat-tails for a nice post-war career and basically escaped with little criticism. DW: Could you comment upon significant differences or conclusions that have arisen from your own research in comparison with previous literature [specifically Meaney on Cool Spring, Alexander on Chambersburg, and Haselberger on Chambersburg & Moorefield]? SP: I think the primary and most important difference is that my work places all of these events into the context of the campaign that was occurring in July 1864. It also offers detailed studies of Rutherford 's Farm and 2nd Kernstown. I have also had the benefit of new primary sources that I located in my research or which have been published since these works came out. I enjoyed all three of the books you mentioned and the work of those authors helped me with my study. DW: As you've also mentioned above, you are the author of the main article of Blue and Gray Magazine's current Cedar Creek issue. I've read Lewis's battle history (of which I recall absolutely nothing), but I gather that Ted Mahr's study is widely considered the best single work. Could you comment on the merits of both? SP: For starters, there is no comparison between the two books. Mahr's book is the most detailed analytical work on Cedar Creek that is out there and I recommend it to all who can get their hands on a copy [ed. good luck!]. As Ted said in his preface, it has a "strong emphasis on the Confederate perspective." Ted hoped to revise and republish his book with a more balanced look at the battle, but I believe that health concerns have slowed down his effort. I hope that he can eventually get that done. Lewis' piece is more of a novelistic endeavor following the battle through the eyes of personalities like Custer, Rosser, and Ramseur and others. I read it when it first came out and enjoyed it at the time. I do recommend that you read Jeff Wert's From Winchester to Cedar Creek. SP: More '64 Valley....The next book will pick up where "Shenandoah Summer" left off with Sheridan taking command. There is a lot of exciting action in August and early September that has been completely overlooked. Custer fans should take note. The book will have the battle of Third Winchester/Opequon Creek as its heart and wrap up with Fisher's Hill. Then I want to delve into biography - Sheridan, Early ??? DW: Great news! I particularly look forward to your assessment of Sheridan. I must say I am a bit of a Wittenbergian when it comes to Phil. Thanks for your time, Scott, and I hope everyone joining us here gets a chance to read "Shenandoah Summer". The "Ship of the Week" header over at Andrew Duppstadt's blog Civil War Navy is a constant reminder that the Civil War years saw perhaps the weirdest array of naval architecture in the history of warfare, from revolutionary original designs to perhaps less well thought out conversions. My personal favorite is the ironclad U.S.S. Choctaw, reproduced wonderfully by artist Tom Freeman and shown here gracing the cover of the U.S. Naval Institute's Naval History magazine (June 2006 issue). It has my vote for both the strangest and coolest of Civil War warships. 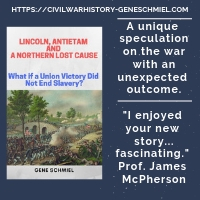 While a number of books* have chronicled the individual battles fought during the July - August 1864 time frame examined by Shenandoah Summer, no single treatment has placed those events within the context of the entire 1864 Valley Campaign nearly as well as Scott Patchan's latest book. Shenandoah Summer is a first rate campaign study, a bridging work that weaves together dangling threads left behind by the bookend coverage of the more popular phases of the 1864 Valley Campaign--Jubal Early's raid on Washington and Phil Sheridan's later campaign. As evidenced by his earlier Battle of Piedmont study**, Patchan shines as a researcher and writer of campaign and battlefield narrative. His accounts of the battles of Cool Spring, Rutherford's Farm, Second Kernstown, and Moorefield (along with a number of smaller skirmishes) in Shenandoah Summer are exceptional in both tactical detail and analysis. Patchan's deep knowledge of the geography of the valley is demonstrated in the profound appreciation of the battlefield terrain in his writing. His grasp of the campaign as a whole is equally impressive, the book's final chapter ably serving as a recap and contextual analysis of the political and military fallout from the July - August 1864 battles. A number of major command personalities from both sides come under fresh scrutiny, the author not hesitating to go against the grain. While one must struggle mightily to find in the literature a negative word about Stephen D. Ramseur's military skills, Patchan notes that Confederate general's flaws as an independent commander (significantly apparent at Rutherford Farm) and also his disturbing lack of honesty in his reports. On the Union side, a similarly nuanced view of W.W. Averell is given. Taking into account Averell's aggressiveness and resourcefulness as a cavalry raider (post-dismissal from the Army of the Potomac) and his victory at Moorefield in August 1864, a more well rounded impression of an officer oft dismissed by historians as an overcautious subordinate is provided. Stay tuned for an author Q&A with Scott C. Patchan. We'll examine matters from Shenandoah Summer not covered in the review, and hopefully discuss a few things about the 1864 Valley Campaign in general. "The author's considerable explanatory material and supportive evidence could have been reduced with proper editing. A multipage discussion of how mortar boats could have been employed against Yorktown is one example. Historian James McPherson's advice "not to tell the reader more than he wants to know" is applicable." Ughh. Can't we please put this particular McPhersonian commandment to bed? If this strange statement were ever applicable to CW non-fiction, I should think Beatie would be the least of candidates for it. He is constructing a broad study of the Union's war in the east from the ground up using a vast array of primary sources, much of it new; "considerable explanatory material and supportive evidence" is kinda useful to the project...more like obligatory. To get back to generalities, it's not the first time I've seen reviewers resort to this pronouncement. Taken out of context, I seriously doubt McPherson meant for it to apply to all forms of Civil War non-fiction literature anyway. Unfortunately, many reviewers don't see the distinction. When used in the manner of a general truth, the statement promotes a completely wrongheaded notion of the CW author-reader relationship. Infantilizing the prospective audience of readers doesn't strike me as a useful advancement; and just how does an author or publisher determine 'what the reader wants to know' anyway? Who is "the" reader? I daresay I would prefer a book written by a meticulous and driven Civil War author whose prospective audience is only himself rather than one directed toward a falsely imagined general reader. As for the other point made of "proper editing". I wish it would occur to more critics that lengthy asides involving reams of background material and weight of evidence can be essential parts of the journey--or even perhaps the point of it all. Some reviewers seem at a loss when confronted with works that break the 'rules' of narrative history. If a sidebar takes you off track, so what? Who hasn't followed directions somewhere only to find that travelling down a 'wrong' turn or a trail off the beaten path has placed you at an even more interesting destination. Oliva: "Fort Scott: Courage and Conflict on the Border"
Originally published in 1984, the revised edition of Leo Oliva's Fort Scott is volume one of the Kansas Fort Series published by the KSHS. While Fort Scott* was officially established in 1842, shortages of funding, skilled labor, and materials slowed its progress. 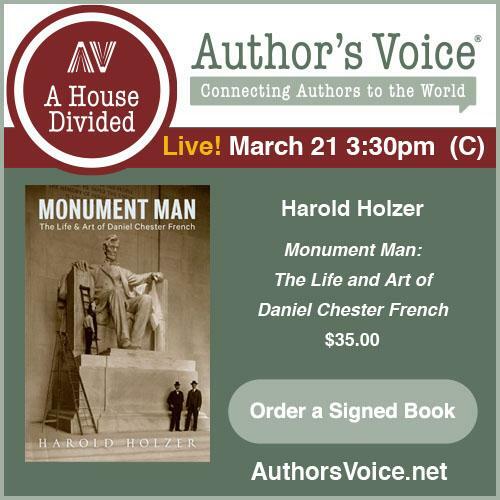 In covering this period, the author includes several interesting biographical sketches of officers involved in choosing the location of the fort and in its construction, men like John Hamilton, Benjamin Davis Moore, and Thomas Swords. According to Oliva, by the time the fort was fully up and running it was largely obsolete in terms of the U.S. army's strategic plan for frontier defense and management, its duties largely assumed by newly established Ft. Riley. By 1853, the fort was abandoned and the buildings auctioned off, to be later incorporated as the town of Fort Scott. The bulk of Fort Scott covers this period 1842-1853. The Kansas territorial troubles saw the return of federal troops to the fort and, while this "Bleeding Kansas" period and the Civil War years are of primary interest to us here, Oliva covers this time only briefly with a 12-page chapter. The fort became a very active military and administrative post again during the Civil War, its original buildings leased to the U.S. government for the duration of the conflict. Fort Scott is very handsomely put together. It is profusely illustrated with photographs, drawings, and artwork. The maps included in the volume are definite assets. Diagrams depict the layout of the fort at various stages and others map the complex territorial interaction of state, federal, and Indian governments. A finely drawn and highly detailed map of Civil War Ft. Scott was particularly welcomed. Fort Scott was originally designed as a three company frontier post, and the appendix includes a number of useful tidbits about the men and units that served during the 1842-1853 period. Commanding officers and post surgeons for this period are listed, along with a table of monthly aggregate strengths for the garrison and a list of companies stationed at the fort. Finally, a meticulous accounting of the 1855 auctioning of Fort Scott's public property is included. Over a number of editions, Leo Oliva has done a very fine job putting together this short history of Fort Scott. Sufficiently detailed while written in a manner that engenders broad appeal, interested individuals of all stripes, from students and general readers to specialists, will likely discover a great deal of useful information. 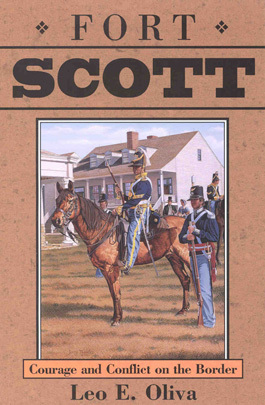 I look forward to examining other volumes in the series.--------------------------* = Fort Scott was named in honor of Bvt Lt. General Winfield Scott, who was reportedly displeased to have his name associated with a fort he considered insignificant. ed. 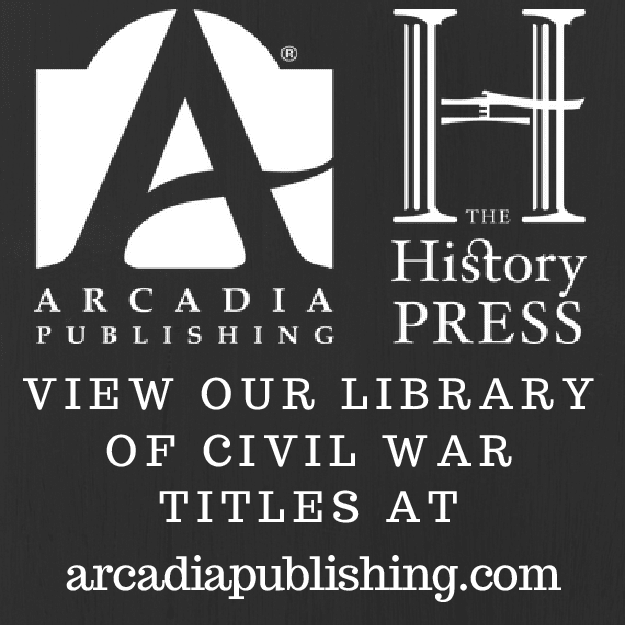 Christ: "'The Earth Reeled and Trees Trembled': Civil War Arkansas"
The Earth Reeled and Trees Trembled is a fascinating collection of essays based on Old State House Museum (Little Rock, AR) seminar topics originally presented in 2003 and 2004. Gathered together in a volume edited by Mark Christ, Community Outreach Director for the Arkansas Historic Preservation Program, these essays cover a broad range of subjects from politics and society to military campaigns. Readers will also find fascinating monographs on geography and medicine. Christ, the editor of several fine books to include Rugged and Sublime and All Cut to Pieces and Gone to Hell among others, is also a contributor of two articles. I'll begin with a brief description of the book's overall presentation and then comment on each essay separately below. The collection is bound in a sturdy paperback that's also very attractive. Numerous maps, photographs, and illustrations enhance the text, which is arranged in double column format for easy reading. Each essay is also thoroughly annotated, some with quite extensive commentary. In terms of consistent quality and freshness of approach among the chapters, this is one of the best Civil War essay collections I have come across. Prof. Dougan, perhaps best known for his book Confederate Arkansas: The People and Politics of a Frontier State in Wartime (Univ. of Alabama Press, 1976), starts things off with a lively account of Arkansas history from its origins through the late 19th century. His often biting wit rather reminds me of Richard McMurry's forthright style of analysis. With early Arkansas's rejection of banks and funding for higher education and internal improvements, Dougan makes a case for a long standing state political culture of deliberate backwardness. The essay is also an interesting examination of antebellum Arkansas politics and the relative merits of Confederate war governors Henry Rector and Harris Flanagin. The first Christ essay is a marvelous summary of Union General Frederick Steele's campaign that resulted in the capture of Little Rock in September 1863. The author, whose masters thesis is a study of this campaign, observes (correctly, I believe) that the seeds of the Arkansas capital's fall were sown in the disastrous Confederate defeat at Helena in July. The Union march to Little Rock and the battles of Brownsville, Bayou Meto, and Bayou Fourche are covered, along with the Confederate retreat and the limited Union pursuit. Losing the capital was a disastrous blow to Arkansas's Confederate supporters. Manpower losses were slight but state morale and political will was shattered. Steele was able to take the fortified capital swiftly and cheaply, with less than 150 battle casualties. The only quibble I have with this fine account is the dearth of maps. A single campaign map was reproduced from the O.R. Atlas but it's very reduced in size and difficult to read. This essay details a regiment's experience of occupation duties in Little Rock and along the Arkansas River at places like Pine Bluff. [An aesthetic aside: The 3rd Minnesota was one of the first Federal units to enter Little Rock, and I was glad to see the publisher include a reproduction of the Arthurs painting that so vividly depicts this event.] While in Little Rock, the 3rd found that a generally conciliatory policy toward the citizens paid dividends. On the other hand, garrison life had its perils, with the regiment suffering tremendously from disease. Recruitment of black soldiers is also discussed by Larson. The individual mentioned in the title (Alfred Gales, last name later changed to Miller) was an escaped slave who became a cook for the regiment and followed the unit back to Minnesota after the war. Unfortunately, very little is known about him, leaving his story frustratingly incomplete. This brief essay outlines the staffing and equipping of the medical corps in the Confederacy's Trans-Mississippi Department. A brief rundown of the medical education options for period physicians is given, with due notice given to several well educated doctors that served with particular distinction. Not surprisingly, as Pitcock co-edited his diary* with Bill Gurley in 2002, Dr. William McPheeters's efforts in improving patient care figure prominently. Finally, the difficulties experienced (and creative methods employed) in obtaining medicines are recounted. Here, Roberts examines the hydrology of the waterways of Arkansas and their relative merits as transportation routes. With the Arkansas River so frustratingly unpredictable, he rightly views the White River as the most useful river supply avenue in the state for Union forces. While the ironclads grab the headlines, this essay correctly gives the tinclad its proper due as the workhorse of the Union's inland waterway navy. With no comparable naval presence, the Confederates depended on fixed points of defense and harrassment by small scale hit and run attacks. Most Arkansas rivers were narrow and shallow, with dense foliage lining the banks, perfect for ambush attacks. In the end, however, neither strategy scored lasting success. Gary Joiner's contribution is a nice summary of the Camden Expedition (the northern wing of the 1864 Red River Campaign). Readers of the author's previous works One Damn Blunder and Through the Howling Wilderness will find themselves on familiar ground. The skill of Confederate cavalry generals Marmaduke and Fagan is lauded, while the decision making of the high command of both sides (Price, Kirby Smith and Steele) comes under heavy criticism. This is a truly wonderful chapter, both for its originality and for the fascinating insights it provides into battlefield medicine. Here, Bill Gurley examines the detailed journal of Dr. Henry Dye and gleans his surgeon's notes for 25 selected case studies of wounded Confederate soldiers from the Battle of Jenkins' Ferry. Dye's sketches of the wounds are reproduced in the essay (the originals are in color) and the notes include both wound descriptions and diagnostic/treatment information. It is perhaps surprising how many serious limb wounds were successfully cared for without resorting to amputation, and medically knowledgable readers will likely marvel at some of the innovative treatment methods. Tom Wing gives us a look at the various conflicts surrounding Fort Smith*** in 1864. Both Little Rock and Fort Smith fell to Union forces in September 1863, and 1864 saw efforts by the Confederates to harass the Union defenders and perhaps recapture the fort. Brief overviews of these battles and skirmishes are provided, along with a really nice period map of Fort Smith and environs. Mark Christ's second essay chronicles Confederate general J.O. Shelby's successful campaign of recruitment and harassment in northeast Arkansas in the months preceding Price's Raid. With Union garrisons spread thinly throughout the region, Shelby was able to cross the Arkansas River above Little Rock and strike at two critical nodes of Union transportation and supply, the White River and the Little Rock and Memphis Railroad. Isolated Union garrisons and forage stations in the region were struck repeatedly. The most noteable Confederate success on the White River was the capture and destruction of the U.S.S. Queen City, a heavily armed tinclad. During this time, Shelby gathered in thousands of recruits (both willing and unwilling). The Union army's focus on Shelby's efforts also facilitated Sterling Price's ability to traverse northern Arkansas relatively unhindered on his way to Missouri. Daniel Sutherland is no stranger to the study of guerrilla warfare in Arkansas***, and here he surveys the evolution of guerrilla conflict in the state and its negative consequences upon the civilian population and the opposing militaries. * - I Acted from Principle: The Civil War Diary of Dr. William M. McPheeters, Confederate Surgeon in the Trans-Mississippi (University of Arkansas Press, 2002). ** - It is fitting that Ed Bearss is mentioned in the book's dedication as he pioneered the study of the Civil War at Fort Smith. *** - Guerrillas, Unionists, and Violence on the Confederate Home Front (Univ. of Arkansas Press, 1999) and Civil War Arkansas: Beyond Battles and Leaders (Univ. of Arkansas Press, 2000). University of Nebraska Press's publication of Shenandoah Summer: The 1864 Valley Campaign , should serve to further cement Scott Patchan's reputation as a bright light among 1864 Valley Campaign scholars. Along with the previous work of Haselberger, Alexander, and Meaney (among others), Patchan's book helps bridge existing gaps in the literature between Early's Raid on Washington and Phil Sheridan's destructive final campaign in the valley. Patchan is also the author of a very impressive battle study [see brief review] drawn from Hunter's Raid, The Forgotten Fury: The Battle of Piedmont, Virginia (Sergeant Kirkland's Press, 1996), which is sadly out of print. I should have a review up of Shenandoah Summer within a few weeks, and Scott has also consented to be subjected to an author Q&A (haven't had one of those in a while). You might also wish to check out the current issue of Blue and Gray Magazine. The feature article on the Battle of Cedar Creek is authored by Patchan. I think it also deserves mention that, while specialization in military history isn't exactly popular among university programs, the subject is far from ignored or marginalized by most of the better academic presses. It should be pretty clear to readers by this point that I have an affinity for military studies, and yet probably two-thirds of more of the books I read and/or review on this site are published by university presses. Even for someone like me whose primary Civil War study interests are more western in nature, the release of another volume in Russel Beatie's command history of the U.S. government's most prominent army is much anticipated. For me, there are few upcoming books that generate as much excitement. As readers of the first two volumes are already doubtless aware, the publisher has changed in the middle of the enterprise. Some improvements are immediately noticeable. Although not immune to scattered errors, the text is certainly cleaner this third time around. New publisher Savas Beatie has elected to keep the same overall presentation (jacket theme, print, etc.) and, perhaps most thankfully, has also decided to keep the use of footnotes vs. endnotes. This is very helpful in immediately appreciating the scale and use of the new and unusual material the author has amassed in his decades of research. Also, the notes themselves often make for useful reading. The cartographer, well known mapmaker George Skoch, is new to the series with volume III and he does his usual fine work. The operational and tactical maps are appropriate to the text and deeply helpful in understanding military movements. Some, such as the one detailing channels and navigational depths of the creeks and inland waterways of the lower peninsula are thoughtfully included for the more deeply involved readers. Even the bibliography is a uniquely interesting read as, directly below many if not most entries, the author has recorded his thoughts on the source's value. Beatie's writing does have its idiosyncracies. An undoubtedly controversial carryover is the author's continued penchant for his "indirect discourse converted to direct" use of source materials. The degree of manipulation involved in accomplishing this has never been explained and, in lieu of dropping the practice altogether, one wishes the author would at least provide a detailed example of this irregular methodology. A central examination of Army of the Potomac: McClellan's First Campaign [ed. is the 1861 West(ern) Virginia campaign chopped liver? ], and the series in general, is the interaction between the Lincoln administration and the army's officer corps (particularly George McClellan). This task is accomplished through heavy use of primary sources. Of course, this is a trait common to all worthwhile studies, but Beatie takes it to another level. In doing so, Beatie is unburdened by the 142 years of insufficiently critical scholarship of Lincoln as Commander-in-Chief (sparse though it is). While narrowly focused, it's a completely fresh reassessment. As a reader there is an absorbing immediacy to the narrative that really allows one to view the magnitude of Lincoln's strategic errors in a proper perspective. While never sparing McClellan from appropriate criticism, the popular idea of Lincoln as a talented natural strategist and war manager takes a beating. Issues involving strategic decision making processes, interservice cooperation, information security, and the withholding of vital reinforcements of men & material are discussed from multiple angles. Lincoln often displayed an unfortunate inclination for allowing purely political matters to trump military necessity. This is very clearly seen with the decision to transfer Blenker's division to the Mountain Department and in allowing Gen. Wool to keep his entire command independent of McClellan. This is all in addition to the president's critical decision to withhold McDowell's I Corps. According to Beatie's largely convincing arguments, and contrary to popular belief, McClellan was not set up beautifully for success on the peninsula. The author's research and well supported conclusions about the Lincoln-Stanton-McClellan relationship pound deep cracks into the cast-iron mold forged by generations of scholarship. However, it is my sincere hope that this series does not become pigeonholed as a mere effort to revive McClellan's military reputation as one of the war's great captains at the expense of Lincoln. That simplificiation would be a grave injustice to this author and his monumental undertaking. Another great strength of Beatie's narrative is the depth with which he examines the Union army's high command and his willingness to enter dusty cubbyholes. His detailed discussion of the degree of influence exerted by high ranking generals such as Ethan Allen Hitchcock and John E. Wool at critical junctures is fresh and fascinating. In chapter 15, there is an absolutely brilliant assessment of James Wadsworth's conduct as Washington garrison commander and of the Lincoln administration's fundamental misunderstanding of the most relevant military issues of the capital's defense system. In general, AofP is a command level study that does not concern itself with the tactical minutiae of individual battles. On the other hand, the Union preparations for breaching the Warwick River-Yorktown line are discussed in great detail, making it easily the best account from any single source. Beatie's conclusions about Kernstown and James Shield's conduct during and after the battle enrich our understanding of it. They mesh well when intersecting with the work of that battle's definitive chronicler, Gary Ecelbarger. 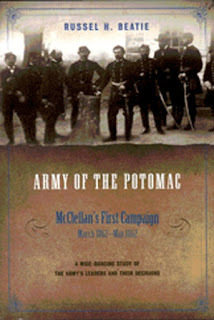 Additionally, the author's patient efforts to sort out the details of the confused pursuit of the Confederate rear guard to Williamsburg, and the muddled command decisions during the battle itself, reward the reader with yet another fresh interpretation of the strengths and failings of the individuals comprising the Army of the Potomac's high command at this stage of the war. The role (or non-role) of the navy in the campaign is another very prominent theme, nicely summarized in the book's final chapter. Let's face it. If you want to want to understand the war in the east, this series is essential reading. With three volumes completed now, covering the war from the Union side up to May 1862, we really have in our hands the most detailed, most challenging, and perhaps most controversial scholarship for this period to date. Some excellent books have been published that deal with direct Union efforts against the Charleston defenses. Two of the best are Patrick Brennan's Secessionville: Assault on Charleston and Stephen Wise's phenomenal study, Gate of Hell: Campaign for Charleston Harbor, 1863 . However, the coastal region between Charleston and Savannah was an active front throughout the war. An important aspect of these coastal operations were the repeated U.S. attempts to cut the vital Charleston and Savannah Railroad, perhaps most notably during the October 1862 Pocotaligo Expedition and again with two attempts in late 1864, the November 30 Battle of Honey Hill and the fight a week later at Tulifiny Crossroads. This brings me to the reason for this post. The release date is still way off in the future (February 2008), but University of South Carolina Press will be publishing Vital Rails: The Civil War History of the Charleston & Savannah Railroad . I haven't been able to obtain a description of this book, but it sounds interesting and makes me wonder what its focus is on beyond the obvious. Steenburn: "Silent Echoes of Johnsonville"
Colonel Donald H. Steenburn's Silent Echoes of Johnsonville [(OP 2nd Ed. 2001, from orig. 1994, Elk River Press) Pages total/main: 143/121. Softcover, maps, photos, notes, biblio] is a military history of Nathan Bedford Forrest's highly successful Johnsonville Raid. Although utilizing predominately southern sources and written largely from the Confederate viewpoint, the book's account of Forrest's effective but temporary blockade of the Tennessee River and his destruction of the massive Union supply depot is actually pretty good. On the other hand, the hyperbole and generally worshipful tone of the author's description of Forrest's martial abilities throughout gets a bit grating. Multiple errors in the background material give Silent Echoes a shaky start. Additionally, the writing is choppy and, in the interests of letting the soldiers tell their story unhindered, the author often shies away from analyzing the merits of competing sources. For instance, Steenburg writes his lengthy account of the Confederate bombardment, fully giving the impression that the artillery alone caused the massive losses in shipping, buildings, and materiel. Immediately following, the author provides a number of sources from both sides claiming that the fires were deliberately set by Union soldiers to keep the depot out of the hands of the enemy (who were assumed to be crossing the river). These contradictions pass with little commentary and no real effort is made to weigh the competing evidence in order to arrive at the most likely conclusion. However, if I had a vote it would be for the primacy of the latter. Steenburg concludes with a short description of post war salvage operations and the current state of the site, largely buried underwater in the wake of TVA projects. Quirky, uneven, and flawed, Silent Echoes is all of those, but it's an intriguing failure and I would still recommend it to forgiving readers with a narrow interest in this particular raid. The operation itself is fascinating, and, as far as I know, this is the only book length study available. A number of readers have asked about some of the titles pictured in the new header. Although some favorites are indeed pictured there, they are not all books that I particular like or would recommend, so please don't take it that way. It's simply random images from the home library. Perhaps it has always been this way in non-fiction publishing, but I am noticing more and more the variance between the book page totals on various publishing and online bookselling websites. For a given title, it is not uncommon to see a different page total at every venue visited; and the differences can be quite striking. Additionally, the retail version of a particular book can often be found in reality to have far fewer pages than the publisher's 'official' total. Whether this is an intentional marketing move ("page inflation") or an unfortunate consequence of the workings of the publishing pipeline, I don't know. Perhaps publishers submit the totals to retail websites & distributors from early galleys, and final formatting, font changes, etc. cut the page total down substantially. On the other hand, I've never discovered a book in my hands to be lengthier than advertised! Somewhat annoyed at all this, you might have noticed that I've been rather guilty of creating my own page total convention. For the reviews on this site, I take the number on the last page of the main text and add the notes and appendices to arrive at my own number. This is more of a 'reading total', and assumes that you are like me and always read the notes and appendices. This was never made clear, but I wanted to mention the new change. From now on the convention I will use will involve two numbers "Pages: Total/Main Text".